Ostra Halls, located Behind MKO Abiola Gardens, Opposite NNPC Gas Plant Alausa, Ikeja, Lagos, Nigeria. This hotel offers a serene environment in Lagos, a restaurant, barbeque facilities and bars. Free Wi-Fi and private parking space are available on-site. 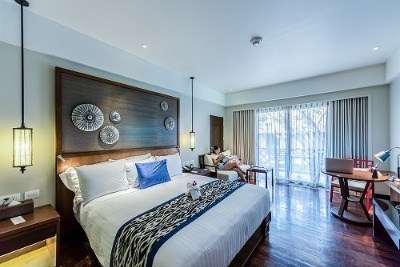 Ostra Halls offers rooms with modern interior decor. The rooms are equipped with tile flooring, an air conditioner, work desk, king-size bed, telephone, flat screen TV with satellite channels, a fridge, armchairs and an en-suite bathroom with toilet paper, towels and linen provided free. Categories of rooms available are Standard, Standard Double, Ostra Double and Deluxe. The hotel offers complimentary breakfast with an option of room service and local and continental food options are offered at the on-site restaurant while a wide variety of non-alcoholic and alcoholic drinks can be ordered at the bar on-site. It also offers services such as 24-hour front desk, Concierge service, Luggage Storage, Cleaning services, Dry cleaning/Laundry service, a meeting/ banquet facility and round-the-clock security. Ostra Halls is a 30 minutes' drive from Muritala Muhammed Airport. Check out: By 12:00 noon. Children: Kids not older than age 5 can stay for free. Q: Does Ostra Halls offer free Wi-Fi? A: Free Wi-Fi is made available in each room at Ostra Halls. Q: Can guests get free breakfast from Ostra Halls? A: Ostra Halls does not offer complimentary breakfast to guests. Q: Are the TVs in Ostra Halls showing just local movies? A: Each TV is connected to a cable network where you can watch both local and international channels. Q: Is there an on-site spa facility at Ostra Halls? A: There is no spa facility at Ostra Halls. Q: Does Ostra Halls have a lounge/bar? A: There is a lounge/bar where guests can get exotic drinks and snacks. Ostra Halls is a budget hotel in Ikeja, Lagos. Children: Children are permitted to stay for free. Cards accepted: Visa, MasterCard, and Cash Payments only. I stayed at the hotel and I had a good time there. I had no issues checking in and out.I must say that I really enjoyed my stay there.The staff were very nice,friendly and efficient. The room was well cleaned and the environment was very comfortable and conducive to stay in. I would rate the hotel an eight over ten. Very nice place. This is a very good hotel. It was an excellent stay, a home away from home! It is a very organised place, and the rooms are beautiful also. Have nice pictures of Ostra Halls ?